We've once again completed the leveling rewards sticky. This is the only thread of its kind out in the Hearthstone world! Thank you to the 72 people who have made this thread possible in one way or another. Here is the proof for all the level 20 goldens and some of the 22s and on. I will be updating this as much as I can too help out. All the level 22s are the same as the level 20s, and the level 24s and 26s as well. As far as before level 20 rewards I can't remember =( I should have been taking screen shots of them. 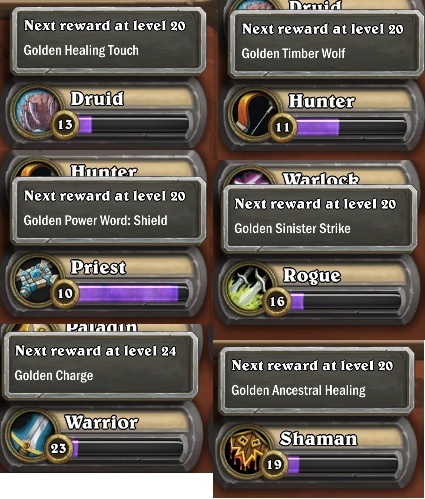 It starts giving you one of each golden basic class cards at 20 every 2 levels but eventually it gets down to one per level, with level 50 unlocking your golden hero. So pretty much you need to Level up to have those cards unless u are lucky to receive them through booster packs? Or those cards are only receivable through leveling since they look class specific cards? That's what I had assumed, good to see I was right. The level 20 warrior is also Heroic strike If you needed some proof. @zagnaphein you cant unlock any of these cards in boosters, they are basic cards and will unlock through leveling. 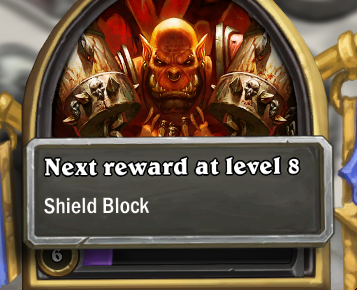 All the standard cards by level ten then you will start unlocking the golden versions. Rogue 22 is golden sinister strike, 24-26 looks to be golden assassinates. Golden Arcane Shots at 24 and 26. Aw man this list will be complete by the time europe gets beta. I would have wanted to contribute. I've updated the thread up til here. Thanks guys, going to get some sleep. Pretty sure the warrior level 8 is Arcanite Reaper x 2. Either that, or Shield Block is switched with it. I.e. SB is level 8 and AR is level 10. Yeah I was thinking that too its either reaper or shield block. Awesome thread is awesome! Golden cards are a great incentive (for me at least) to keep leveling up a class. Confirming level 26 Hunter is gold Arcane shot. http://www.youtube.com/watch?v=IQw7jaR0byM - Cut to the 7:05 mark. 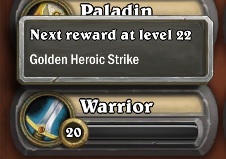 Confirming Gold Hand of Protection for Paladins at level 26. 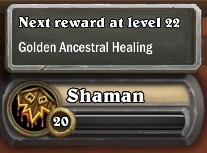 EDIT: If it follows the trend of the other decks, then level 24 should be a Gold Hand of Protection as well. I just checked my library and I have 2 copies of the gold one (pretty sure I didn't crack any of those open).